Hip arthroscopic surgery is a surgical process intended to repair damage to the cartilage or tears in the joint. Arthroscopic surgery can be utilized for most hip problems so long as you do not need a full hip replacement. Arthroscopic surgery has become one of the more popular surgical methods of the last few years because it brings with it faster recovery time and fewer complications. done the Arizona orthopedic surgeon will make a small incision around the affected joint through which a tube is inserted. On the end of the tube is a small video camera. This camera is linked directly to the video screens inside of the operating room. 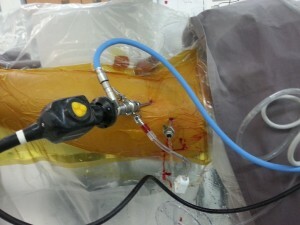 This allows the surgeon to review the interior of the joint up close and locate the exact area that is affected. Once the orthopedic surgeon in Pheonix is able to find the area which is affected they can make a secondary incision through which microscopic surgical tools are inserted. While the first incision is maintained with the camera in place the surgical tools inserted through the second incision are used by the skilled surgeon to carefully repair the damaged area. With this type of surgery the surgeon can literally see the damaged area and repair it immediately. This may include removing a piece of loose cartilage, or fixing a torn labrum. The rise in popularity for arthroscopic surgery is due to the fact that the surgery is minimally invasive and significantly easier to conduct compared to open surgery. Instead of opening up the entire joint to view the interior a smaller incision is made allowing the surgeon to operate quickly. This also brings with it the added benefit that the surgeon can locate the problem area and determine exactly what is needed on the spot without having to conduct open surgery. of the nicest aspect of arthroscopic surgery for the patient is that the procedure is an outpatient procedure this means that the patient can literally check in and check out of the hospital on the same day without the need to stay overnight. When recovering from arthroscopic surgery it is required first and foremost that you receive a ride home from a close friend or family member or at the very least a taxi. Recovery from a surgical process, even one minor is arthroscopic surgery, will vary in terms of the time required based on your age, your current health condition, the severity of the surgical process, what happens during surgery, and external factors. At Phoenix Shoulder and Knee, Dr. Adam Farber is a highly skilled sports medicine doctor treating patients from Phoenix, Scottsdale, Tempe and surrounding areas. Most insurance is accepted, call (480) 219-3342 today!